If you’re a developer interested in robots, you may have heard the news—we’re experiencing a “moment” in cloud robotics services. In under four months (late September 2018 to early January 2019), four technology titans stepped forward to stake major claims in this space. This. Is. Not. An. Accident. Cloud-based services—from environment navigation to computer vision to fleet management—have the potential to make owning, coding, and managing robots way more efficient. Cloud robotics services that take the pain out of the robot development lifecycle are a vital step forward on the path to increased robot affordability and ease of development, especially for small- and medium-sized businesses. More to the point, with Amazon, Google, Honda, and Microsoft all piling into the same niche in rapid succession, cloud robotics services may also be the path to increased profitability for those companies who can hold significant mindshare. But this is a post about development, not investment, and (I hope) you may be thinking about coding for robots yourself. We’ll take one view into this high-growth world — cloud services that can be used by physical robots — and check out the landscape from a developer’s perspective. In some sense, any cloud service a robot can access is a cloud robotics service. But we’re looking at robot-specific cloud services today. From shared location data to world simulators, these are cloud services that are intended to make coding robots easier. Cloud “robots”. These are purely virtual, automated robotic processes, not actual robots. For a couple of representative examples, check out Robot Cloud and dinCloud. Robots as a service (plus the cloud). What do businesses want? Low capital expenditures plus mad robot capabilities! Hence the rise of robot rentals—on-location at your business—with cloud-enabled, pay-as-you-go services attached. Hirebotics is a good example. • rerobots provides the ability to try “experimental robotics equipment” including our own Misty I Developer Edition prototypes. • Georgia Tech’s Robotarium supplies access to their GRITSBot swarm robots. These are all cool topics, but they’re not for us today. I’m including announcement dates with these cloud robotics services, as it’s amazing to see just how much movement is happening right now. • Honda Robotics as a Service Platform (Jan 2019) — Introduced with CES, Honda has large aspirations for their robotics as a service platform. Details remain limited, but providing standardized, cloud-based data services for diverse robots seems central. And they do mean diverse — robots shown run the gamut from home to commercial to vehicular. And the API/SDK layer intends to cover a lot of ground as well: data, communication, robotic “cooperation”, and other services. In the absence of details, we can only surmise that as a longtime maker and user of personal and industrial robots, Honda may be evaluating externalizing and making generic some of the services they’ve refined for internal use. Honda’s RaaS platform wants to be all things to all robots. Given their extensive robotics experience, they just might manage it. Image © Honda Global, Honda Motor Co., Ltd.
• Amazon AWS RoboMaker (Nov 2018) — This service not only eases integration of the open-source ROS framework with Amazon’s cloud-based machine learning services, it adds true robot-specific value as well. AWS RoboMaker includes an IDE to make coding with ROS easier, a robot simulation service with pre-built worlds, and robot fleet management that even handles OTA updates. There’s a lot here for developers who are already comfortable with ROS and accustomed to the AWS pay-as-you-go pricing model. And as with Honda, given Amazon’s rumored upcoming home robot, these too may be services that are externalized versions of ones that Amazon has already been using in-house. 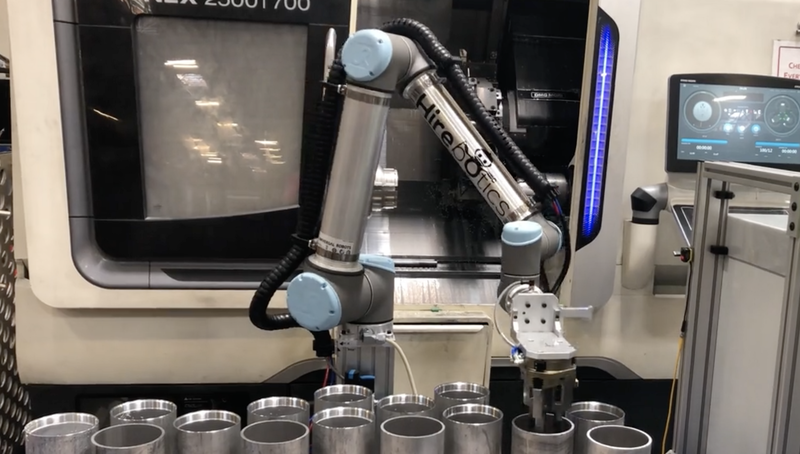 • Google Cloud Robotics (Oct 2018) — Tuned to the needs of collaborative robots (aka cobots), Google’s Cloud Robotics services aim to take the pain out of data sharing between robots in commercial use. With an emphasis on managing location data to enable fast, accurate, and safe robot movements, these are pay-as-you-go services that are intended to readily allow the use of Google’s entire AI suite. The “ecosystem” is designed to be robot-platform-agnostic so that cobots from different vendors can readily share data. Bottom line: this is very much a solution for robots working at scale, in what are most likely to be industrial settings. As such, it’s likely to be an interesting counterpoint to Microsoft’s efforts with the ROS Industrial Consortium. • Microsoft ROS for Windows (Sep 2018) — This past fall, Microsoft announced both that they joined the ROS Industrial Consortium and their experimental release of ROS1 for Windows. The ROS for Windows libraries and tools are explicitly intended to bring Windows IoT Enterprise and ROS together, providing your local robot with the benefits of Microsoft’s enterprise expertise (security, scalability, etc.). And, as with the Amazon and Google offerings, there’s also the benefit of increased ease of use for integrating with Microsoft’s cloud-based ML/AI services. That said, as with Google, any time you see a company talking about making robots “safer to be around” you can bet that a big audience for their technology is likely to be cobots. The crazy-fast growth in industrial robotics is not lost on either Google or Microsoft. But if industrial robots are ever to be free of their cages and glass walls, something has to be done about safety. Image © ATONATON, LLC. / Autodesk, Inc. These cloud robotics services may be up against industry giants, but as they’re slightly older they do have existing mindshare on their side. To show how the pace of change has suddenly accelerated, I’m including rough origin dates for these projects as well, so you can compare them with the sudden influx of announcements above. • Rapyuta (2013) — A lot of fairly limited services call themselves platforms, but Rapyuta may actually hit the bar for a comprehensive robot development solution. Based on the European Union’s RoboEarth “cloud engine”, Rapyuta aims to be a true full-stack solution for robot-based businesses. Their cloud platform covers everything from dev tools to device (robot) management, messaging, logging, and essential services such as navigation. • RoboBrain (2014) — On the open-source, university side of things, RoboBrain is developing a massive, cloud-accessible knowledge base for robots. With data sources ranging from robot trials to simulations to pretty much whatever looks helpful on the Internet, the intent is to support robot developers working on ML, language, computer vision, and more. • Noos (2017) — If you’re working with robots with limited onboard processing capabilities, you can still use computer vision and mapping/navigation with services from Noos that process your robot’s sensor data. • C2RO (2016) — Although it’s now gone beyond robots as customers for its services, it’s still worth a quick mention of C2RO, which started out as a real-time cloud processing service targeted to developers working with cloud-dependent robots. As long as both robots and the cloud stay hot — basically for the longterm foreseeable future — you can figure cloud robotics will, too. Given that, we should expect pretty much every large tech company to stake a claim in this space, just as they have with mobile, IoT, and AI/ML. For developers, this competition should mean more cloud robotics frameworks and services and better tools and pricing. Cloud robotics is a “trend” that’s here to stay, and that’s a good thing. Thanks for this post’s featured photo go to Matt Pritchard.